Australia is an old continent with much of its remaining mineral endowment obscured by a thick cover of weathered rock, sediment and soil materials. This presents a critical challenge for mineral exploration now and into the future, as the industry currently lacks the fundamental data, scientific knowledge and technological tools needed to discover new, world-class ore deposits buried deep under this cover. The key to discovering new resources under cover is the ability to detect and recognise the distal footprints of deep giant ore systems. A distal footprints ‘toolkit’ will be created; this inter-related suite of tools will include know-how, methodologies, and new field and laboratory analysis techniques. 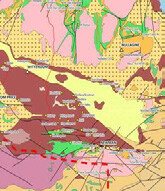 This approach is unique within Australia, and the team aim to eventually provide geophysical data sets and interpretative map products across the area, a field guide to the area, an assessment of mineralogical, chemical, geophysical and geological indicators. It will bring new data, new interpretations, new understandings and new technologies to help discover mineral wealth deep under cover. Aligning with the Australian Academy of Sciences UNCOVER initiative to boost exploration geosciences research in Australia, and the Federal Government’s National Exploration Strategy, the distal footprints of giant ore systems project is a collaboration between CSIRO, UWA (through the Centre for Exploration Targeting), Curtin University, and the Geological Survey of Western Australia. The Collaboration is also drawing on the expertise and industry knowledge of the ARC Centre of Excellence for Core to Crust Fluid Systems and the Minerals Research Institute of Western Australia. Industry partners are also contributing industry knowledge as well as financial support. increase exploration investment in Australia. exploration is conducted in covered terrains.